Topos theory can be regarded as a unifying subject within Mathematics; in the words of Grothendieck, who invented the concept of topos, “It is the theme of toposes which is this “bed”, or this “deep river”, in which come to be married geometry and algebra, topology and arithmetic, mathematical logic and category theory, the world of the continuous and that of the “discontinuous” or “discrete” structures. It is what I have conceived of most broad, to perceive with finesse, by the same language rich of geometric resonances, an “essence” which is common to situations most distant from each other”. Toposes were originally introduced as purveyors of cohomology invariants useful in algebraic geometry (in particular in relation to Weil’s conjectures), but very soon their fruitfulness and prospective impact became apparent also in other fields of Mathematics. More specifically, W. Lawvere and M. Tierney showed, already in the sixties, that toposes can be seen as sorts of mathematical universes in which the familiar constructions on sets remain possible, but which have each their own properties. A few years later, the theory of classifying toposes provided an additional fundamental point of view: to any mathematical theory of a very general form one can canonically associate a topos which embodies its “semantic content”. More recently, toposes have started being effectively used as sorts of “unifying bridges” making it possible to link different mathematical theories together, to generate and study dualities and equivalences, to transfer ideas and results from one mathematical field to another and to demonstrate new results within a given theory. 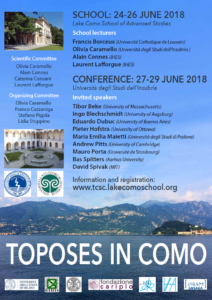 The event “Toposes in Como”, which represents the second edition of the conference “Topos à l’IHES” held in France in 2015, will consist of a three-day school, offering introductory courses for the benefit of students and mathematicians who are not already familiar with topos theory, followed by a three-day congress featuring both invited and contributed presentations on new theoretical advances in the subject as well as applications of toposes in different fields such as algebra, topology, number theory, algebraic geometry, logic, homotopy theory, functional analysis, and computer science. © 2019 Toposes in Como.